Dental implants are the ideal tooth replacement for people who are missing teeth, and they are available at Mason Dental in Grapevine. 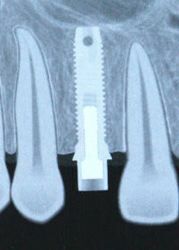 A dental implant is a metal (usually titanium) post inserted into a patient’s jaw bone to replace the missing root. The crown and supporting structure are securely and permanently attached to the post. Titanium is sturdy, and extremely well tolerated by the human body. There are very few instances of rejection. Tooth implants offer a long-term solution to tooth loss. Are you a good candidate for dental implant surgery? Because the metal rod is implanted into the jaw bone, it is essential that you have enough healthy bone at the implant site. We can determine if you do. Age is rarely a factor. Dental implants have been successful in people of all ages. Dental implants are among the procedures offered by Mason Dental in Grapevine. We also offer a range of general dentistry services. Schedule your next checkup and cleaning today.